In a kind of reverse April Fools joke, the first episode of Rick and Morty Season 3 premiered last night. Fans of Adult Swim's Rick and Morty were in for quite a treat last night, when the first episode of the long-awaited Season 3 was suddenly shown as a sort of reverse April Fools joke. The episode debuted on Adult Swim's streaming service and continuously looped all night. 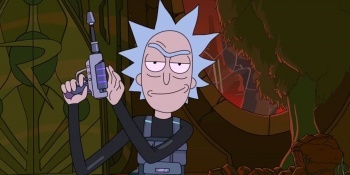 Fans of the show, who are used to being trolled by the creators, were expecting the episode to cut out at any moment, with Rick proclaiming it as an elaborate joke. But rest assured, this was the real deal, and was the actual, full version of episode one. Unfortunately, for those of you hoping that episode 2 will follow next week, the official Rick and Morty Twitter has confirmed that the rest of the season won't air until this summer. If you missed it last night, you can still catch the episode after the season 2 finale airs during today's Adult Swim's all-day back to back Rick and Morty marathon.